Let's be honest: virtual reality (VR) is a nascent market for consumers and nearly non-existent for businesses. VR technology is led by Oculus's Rift Crescent Bay, which still isn't ready for mass consumption, but offers users an immersive environment with high definition imagery and the best movement tracking on the market. Sony's Morpheus headset should be ready as a PS4 connector this year, but Sony won't commit to a release date, and even if they did, the Morpheus user experience isn't as visually stimulating as Rift Crescent Bay's, and movement tracking is incredibly flawed. Samsung Gear VR ($249, £157, AU$285) is the most complete VR device on the market, but it only works with the Samsung Galaxy Note 4 and is uncomfortable to wear. The HP Zvr Virtual Reality Display (pricing TBD) is a desktop monitor that, when paired with 3D glasses, can provide real-time virtual experiences. 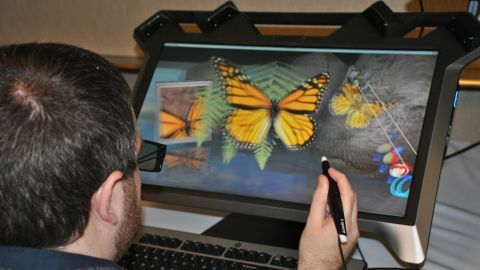 Built with four cameras that connect with sensors built into complementary 3D glasses and a stylus pen, the 23.6-inch full HD, stereoscopic monitor tracks your head and hand movements so you can manipulate on-screen content. Users can rotate, navigate and zoom in and out of every detail of on-screen content by using the stylus in concert with head movements. For example: if you're staring at a medieval castle on your desktop, you could go around to the side of the walls, you could open the door and enter or lift the castle and place it in a different position, among many other possibilities. Specifically designed for architectural, computer-aided design, education, and scientific content, the Zvr display makes teaching, practicing and demoing more realistic than traditional 2D displays. HP says it envisions students learning how to dissect frogs on the machine without having to actually take a scalpel to poor Kermit. During the middle of 2015 HP says you will be able to project your 3D models to a 2D screen for easy team collaboration. So when the aforementioned student moves the virtual frog's heart and kidneys (in his/her 3D virtual environment), the rest of the class will be able to watch the dissection in standard 2D.